I INSIST YOU READ THIS TO THE END. I was very driven to write this post because it will help you understand why it is so difficult for millions of people and possibly you to stop consuming harmful substances. I recently read ‘The Pleasure Trap’ by Douglas Lisle Ph.D. I was introduced to this concept while completing a plant-based nutrition certification about three years ago and was very intrigued by it. I was thrilled to find an entire book was written on it. It explains why so many of us in the Western World find it so difficult to abstain from animal foods and processed foods. I hope you will enjoy my synopsis of how this internal human mechanism controls our behavior. Human behavior is determined by three forces known as the Motivational triad. Innately we are motivated to : Seek pleasure; Avoid pain and Conserve energy. Ages ago when food was scarce this mechanism worked as nature intended. The supply of food was inconsistent and sometimes scarce so it was difficult to overeat, processed food wasn’t yet invented and contrary to the Paleo Diet theory, eating animal flesh was rare because it took a lot of energy and luck to slaughter an animal and use it for food. Plus, the occasional consumption of animal flesh did not contain artificial steroids, hormones and antibiotics. In the US today there is an overabundance of food. There are reports that estimate we waste up to 40% of the food produced. (Unfortunately there are people who are almost starving that cannot access this surplus but that’s a post for another day.) This excess of food is the long term residual result of Agriculture which began around 8500BC. In addition to the overabundance of available calories, the ‘food’ very commonly consumed is heavily processed. By defining processed food I will also explain what’s wrong with it? Fiber and water are removed. This makes the food less filling and more calorically concentrated per pound. Raw veggies contain 100 calories per pound. Fresh fruit contains 300 calories per pound. Flesh such as a hamburger meat contains 1200 calories per pound. Nuts and seeds contain 2800 calories per pound. Oil contains 4000 calories per pound! Fiber and water have no calories and help us feel full and aid in digestion and elimination. Stretch receptors in our stomachs are activated when they begin to expand after eating and cause us to physically know when we’ve had enough due to volume. Eating less calorically dense food enables us to feel full with less calories. These foods contain more water and fiber. Denser foods such as chocolate, fries and red meat are very pleasurable and cause dopamine- the pleasure chemical to be released. However, they are not as filling even though calories are high. There are also unprocessed calorically dense foods such as nuts, seeds and dried fruit. I think we can all agree these healthy foods are also easy to overeat too. Nuts, seeds and dried fruit should be eaten in small amounts. 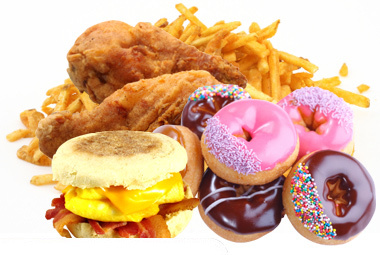 Artificial flavor-enhancing chemicals make the foods addictive and they create artificially induced pleasure. They have a similar effect to drugs. Our bodies are not able to accurately determine when we’ve had enough and unnatural urges to eat more are produced. Food manufacturers have figured out the exact combinations of chemicals to make these foods irresistible. Our pleasure seeking mechanism malfunctions when we regularly consume these foods. They contain added isolated sugars, oils/fats and salt. I listed this as a separate issue from number two because nowadays packaged foods are marketed as all natural and the companies accurately describe their foods as being free from additives and the ‘bad guys’ such as high fructose corn syrup (HFCS). For example agave is touted as a healthy alternative sweetener. News flash: It contains just as much fructose as HFCS and is heavily processed. Sorry. I once thought it was good for me too. We are still not in the clear though. In nature there are no foods that contain two or more of these components: fat, sugar and salt. These ‘naturally’ enhanced foods desensitize our taste buds. The artificial concentration of processed food causes our natural calorie counting mechanism to make errors. For example, honey roasted peanuts. One tiny bag contains at least 200 calories and there’s like 10 peanuts in it! The main culprits are excessive fat and refined carbohydrates. Many of us are not accustomed to the natural flavors and sweetness of whole foods that are, in my opinion, quite satisfying. The abundance and convenience of these foods that exists in today’s modern western society, the social pressure to eat these foods and our bias to realize that they are making us sick in several ways is a problem. So how does one avoid the strong forces of the pleasure trap? Plan ahead. A huge part of my success is planning ahead. In today’s environment of vending machines, convenience stores and unhealthy food at every turn, you’re doomed if you don’t pack a lunch, or seek out restaurants that provide minimally processed plant based foods. You also need to keep the junk food out of your home. If it’s there you’re probably going to eat it at some point. Eat mindfully. I am guilty of eating whilst doing other things like working, driving and watching TV. I will continue to drink my morning green smoothie in the car during my long commute. Getting enough sleep is just as important so it’s a trade off so I can get 20-30 minutes more sleep at night. I am working on eating and only eating when at home. When you do this you are not distracted and you will enjoy the food more. Your mind will also more accurately acknowledge that you’ve eaten and your satiation cues will be more aligned mentally and physically. Let go of the moderation theory. I’m singing the Frozen song in my head now. Everything in moderation regarding food consumption is reasonable when the food being consumed has a natural effect on your central nervous system. You can trust your body to tell you you’ve had enough. When consuming artificially pleasure enhancing foods this system miscalculates when a ‘moderate’ amount has been eaten. So basically it’s a similar effect to an addictive drug. When most people kick a bad habit such as smoking they don’t smoke less cigarettes. They are more successful quitting altogether. This can take a few attempts. From experience, I know if I have one bite of something addictive like cake or french fries it’s hard to not have a few more bites. The first taste is enough to trigger a strong desire for more. Furthermore, if you truly come to realization that these foods are unhealthy and disease-promoting then why would you want to put any amount of it in your body? Finally moderation is too ambiguous. What does it even mean and how is it measured? Trust me, I’m not perfect so I’m talking to myself too as I write this. Give your taste buds time to adjust. It can take 30-60 days for your body to adapt to the taste of real food and to actually enjoy it. I know this sounds crazy but I regularly crave lettuce and salad and now I have alternatives for when I crave something sweet. I am learning how to cook and bake without added sugars and oils. Read some books and do some research. This post is just skimming the surface of the pleasure trap concept. In addition to Dr.Lisle’s book also pick up Unprocessed by Chef AJ, The China Study by T. Colin Campbell and The Beauty Detox Solution my Kimberly Snyder. These books changed my entire perspective on diet as it relates to looking and feeling good and promotion long-term health.